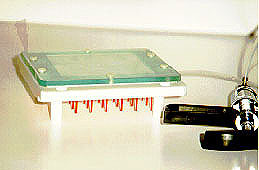 A glass cover to allow mixing of resin for randomization. 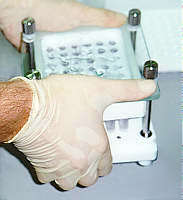 Place the MULTIBLOCK on the lower multistopper and squeeze it until the individual stoppers are flush with the surface of the plate. Release the pressure and inspect the fit of all stoppers. Fill the MULTIBLOCK reactors with the appropriate resin (10-200 mg). 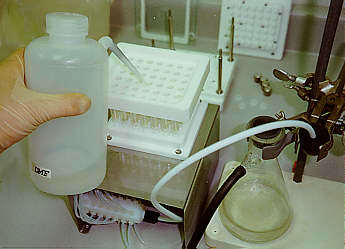 Filling can be performed by pouring in the resin suspension and distributing it into the reactors as in the case of a randomization step of library synthesis (see below). In this case, of course, you will end up with the equal amount of a resin in each reactor. You don't have to use all reactors, you can block some reactors by stoppering them by stoppers cut from the Eppendorf tubes (use only tubes made from colored polyethylene -- clear Eppendorf tubes have a slightly bigger diameter and the stoppers don't fit). Never use force to push the stoppers in. You would damage the upper lip of the well. 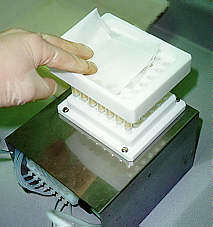 After filling all reactors with the solvent, attach the upper multistopper and let the resin swell (the whole assembly can be placed on the shaker or it can occasionally be shaken by hand). 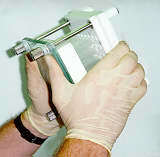 Unscrew the holding nuts and pull up the MULTIBLOCK from the lower multistopper and transfer it to the vacuum adaptor. 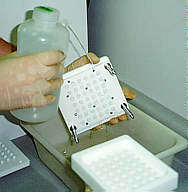 During this operation press the upper multistopper against the body of the block so that the liquid does not leak from the reactors. Apply a vacuum to the vacuum adaptor. - Wash the reactors. You can either fill the reactors using a strong stream (to stir the resin) of the solvent and apply a vacuum after all reactors are filled, or wash the resin by continuous flow (vacuum is on during liquid addition). The second option should be avoided in the case of air sensitive preparations. To save the washing liquid, you can add it by syringe. When you are filling reactors in MULTIBLOCK without suction, the end of the tubing must be higher than the liquid level in the reactors, or else the liquid will leak. 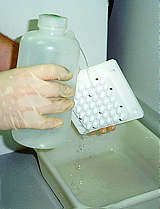 A convenient way of washing is the use of a washing attachment connected to the Wheaton self-refilling repetitive syringe. 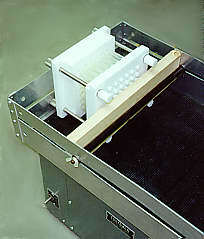 The washing attachment can be used also for simultaneous addition of reagents to all reactors. In this case, any syringe with a luer-lock can be used. (The luer-lock is important -- to achieve uniform distribution of the liquid into all vessels, the delivery must be performed rapidly, thus generating pressure in the tubing connecting the syringe and the washing attachment. An accidental detachment of the syringe from the tubing would result in liquid being sprayed all over the place.) 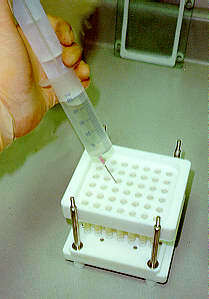 Manual operation of the repetitive syringe can be replaced by the automated actuation of Cavro, Hamilton, or Kloehn syringe pump driven from the computer. 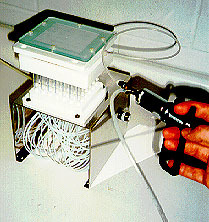 Figures depict the washing attachment itself and the washing attachment on top of the MULTIBLOCK attached to the vacuum adaptor. Again, the washing can be performed either discontinuously (adding the liquid, waiting, suction), or continuously (adding the liquid with applied vacuum). Remove all liquid from the reactors by suction. 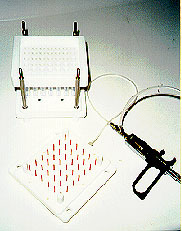 Wipe the droplets of liquid from the upper surface of the MULTIBLOCK (e.g. by paper tissue). Transfer the MULTIBLOCK to the lower multistopper and make sure that it fits tightly (see above). 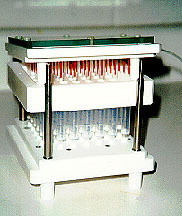 Place the MULTIBLOCK on a shaker. Reactors should be shaken horizontally in the direction of their axes. Shaking reactors in a vertical position makes sense only when working with small amounts of a resin (20-30 mg). Always make sure that the reactors are not leaking. 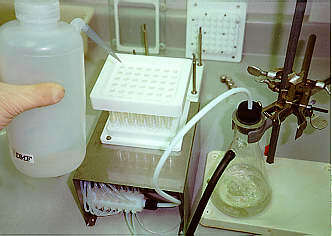 After the reaction is completed, transfer the block to the washing station (see above), wash the reactors, and prepare the block for individual couplings. 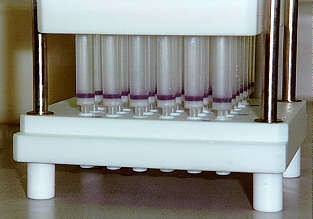 Prepare the individual reagents in an array of Eppendorf tubes. Transfer the solutions to the appropriate reactors using some form of positive control (marking the reactors to which reagents were already added, puncturing paper overlayered on top of the wells, etc.). Manual reagent distribution can be eliminated by integration of MULTIBLOCK with liquid distribution stations (Packard Canberra, Rosys, Zinsser, Tecan,.....), creating thus semiautomatic organic synthesizer. Always wash carefully both multistoppers. Poor washing results in possible contamination and/or leakage of vessels. The only change in this procedure for library preparation is the randomization step. This step can also be used for uniform distribution of the resin at the beginning of synthesis. The resin can be colorized by bromophenol blue for better visualization (or for monitoring of amide bond formation). 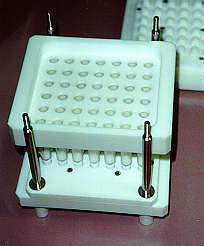 Place the MULTIBLOCK on the lower multistopper and add resin suspension. 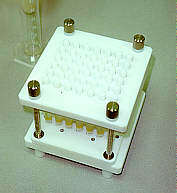 Add solvent until all reactors are filled, and solvent overfows the surface of the block slightly. 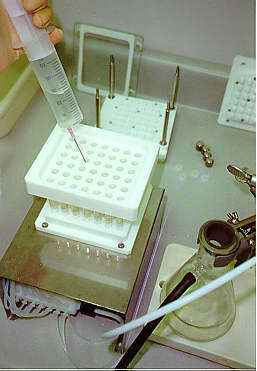 Less solvent will result in nonuniform bead distribution. More solvent will prevent complete randomization. Tightly close the block with the glass cover. Turn the block upside down and shake it until all reactors are empty. Turn the block quickly to the normal position and continue rotating it for about 10 seconds. Place the MULTIBLOCK on the bench and periodically lift one side (left, right, front, back) for about one centimeter. This will wash any beads that had settled onto the upper surface down into the reactors. Inspect for uniformity of distribution. If the distribution was not successful, repeat the whole process. Remove the nuts, and transfer the block with the glass firmly pressed against the block to the vacuum adaptor. Remove the glass cover and apply the vacuum. 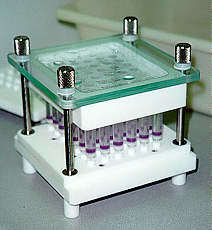 If too many beads stayed attached to the glass cover, silanization of its surface should be performed. However, heating during silanization should be avoided, or the polypropylene foam seal and polyethylene washers must be removed before and reapplied after silanization. All other steps are identical to the multiple synthesis described earlier. Wash the reactors with dichloromethane. Place the block on the lower multistopper and make sure that it will not leak. 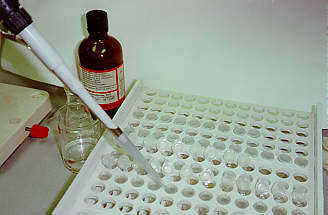 Add mixture K (or other cleavage reagent). Wait for several minutes until the development of gases is finished (if any). Attach upper multistopper and place the block on the shaker. Trifluoroacetic acid mixtures are very difficult to seal tightly and therefore we recommend shaking in vertical position with occasional manual shaking. Open and lift the upper multistopper for several seconds to release any pressure that may have built up. 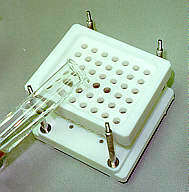 Replace the upper multistopper and while pressing it hard against the upper lip of the block (hold it on the sides with both hands) lift the block from the lower multistopper and transfer it on top of a grid built from a set of containers which will receive the released compounds (e.g., test tubes) that have been carefully arranged in a geometry matching the arrangement of the tips of each reaction vessel. 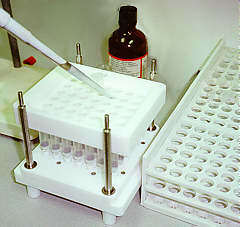 Test tube rack made of foam polypropylene is available from CSPS. Lift the upper multistopper and let the liquid flow out of the columns. Washing of the resin can be done by simple elution with an extraction solvent or by transferring the block onto the lower multistopper, adding a solvent, closing it with the upper multistopper and shaking. Always check carefully whether the upper rim of the reaction vessels is free of resin particles before you attach the upper multistopper. Clean carefully the upper and lower multistoppers after each use. Do not over tighten the nuts holding the multistopper plates and reactor together. Apply force to tighten the locking nuts uniformly.